While practicing hardware moves for both the App Tier and Data Tier, we're making use of the TfsAdminUtil command. We've had some issues with this tool. Mainly around really bad error message reporting. It seems like you can get the error "ERROR: TF55020: Could not access database." for any number of reasons. No other help is provided (e.g. "Check to make sure the Team Foundation Server App Pools and Site are up and running"). I'll try to gather some of the possible causes and solutions when I get some more time. While trying to track down the root cause of this error, we made use of the "Status" switch. Below is what came back. You can see that Status says no Windows services are running as our TFSReports account. However, in the window you can see that "SQL Server Reporting Services" most certainly is running as TFSReports. I think this might be a bug in the tool, which given the poor error message handling, would not surprise me. Yesterday estrada pinged me on how we build Java projects in TFS 2008. If you remember, I wrote an article a while back (about a year ago) on how we did it with TFS 2005. My current group has written a custom MSBuild task to call Ant scripts. I would prefer to use Teamprise Build Extensions, but I joined this group late and they had already had much of the infrastructure written. We do some custom things like write writing Junit tests back to TFS. I don't believe Teamprise Build Extensions has that functionality though I could be wrong. 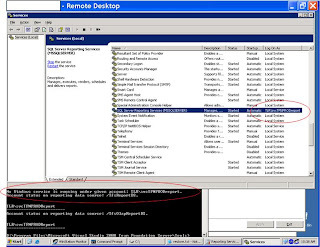 Anyway, my recommendation for calling Ant scripts with TFS 2008 would be to use Teamprise Build Extensions. The setup instructions are great and it's a nice, easy, way to get setup and running. "Windows SharePoint Services version 2 templates are not supported in this version of the product." Today a trusted colleague of mine tried to create a new Team Project in TFS 2008 using the eScrum process templates. We've created around 10 of them in the past with the eScrum process template and everything went fine. Today however, which happened to be a day I'm off sick due to a nasty cold, we get the error "Windows SharePoint Services version 2 templates are not supported in this version of the product." Now why we're getting this now and not in the past, I'm not sure. Something must have changed, or the eScrum template got corrupt on the server. Not sure which is more probable. After pounding my head against the wall, I ran into "Mike's Blog" (a great read if you have some time) where he gives one solution to our error. Here is my summary. 1) Did all the steps under Step 1), except bounced IIS, of Mike's article. Here were my commands when deleting and uploading the site template. 2) I also downloaded the eScum process template, saved the eScrum.stp to .eScrum\SharepointTemplate overwriting the one loaded, and uploaded the new process template labeled as "eScrum with WSS 3.0". To be honest, I'm not sure if this is needed but I did it anyways. 3) Tried to create Team Project called "Vertical Static Content" with new upload I called "eScrum with WSS 3.0" and it worked! NOTES: During some experimentation, we got this error ""Plugin error text: “TF30272: Template not found on the server”" when trying to create a Team Project after deleting the eScrum template and before adding it back again. This leads me to believe there is something, other than what's in the Process Template, which needs to be on the server when creating Team Projects. Why? I can't understand. Just because I continue to forget; if you need to change the TFS Server for your TFS Build Agent, change the add key="AllowedTeamServer" value="http://tfs.mycompany.com:8080/" element in the C:\Program Files\Microsoft Visual Studio 9.0\Common7\IDE\PrivateAssemblies\tfsbuildservice.exe.config file. Then bounce the TFS Build Agent via Services. We have seen some instances where this change does not take affect right away. We even bounced the agent more than once with no affect. Oddly enough, when we got back from lunch everything was working. My assumption is that the agent uses a cache and that was not getting refreshed. Either that or heading to lunch fixes most everything ;). Our FireFox users are having an issue with Reports rendering in a small scroll like box. They can only see the first two inches of a report and must scroll down to see the rest. From what I can tell, a number of people are having this issue. If you search for "Reporting Services in FireFox" the first hit you get is Jon Galloway's post where he describes making the following CSS change. I ran a few test reports after making this change and I think it's going to work for us for now.